Below is the rush transcript for "This Week" on February 16, 2014 and it may contain errors. STEPHANOPOULOS: Good morning. Welcome to This Week. UNIDENTIFIED MALE: Cars around me were just spinning. STEPHANOPOULOS: Monster storms, devastating drought, why so much extreme weather. How can we cope with the consequences and the costs? REP. JOHN BOEHNER, (R) OHIO: This is a lost opportunity for America. STEPHANOPOULOS: The speaker clears the decks, but is his latest surrender setting up GOP games come November. STEPHANOPOULOS: Football stunner: a college star comes out. Will the NFL accept Michael Sam. Our powerhouse roundtable and experts take all of it on. UNIDENTIFIED MALE: I have no patience for useless things. STEPHANOPOULOS: House of Cards is back. And we've got Kevin Spacey live all right here this Sunday morning. STEPHANOPOULOS: Hello again. A lot to get to this Sunday morning when most of us are begging for spring. So much of the country battered by this recordbreaking winter. And just this weekend yet another blizzard in the northeast. Out west, an epic drought. Our panel of experts is here to examine what's behind this weird weather. What, if anything, can be done about it. And ABC meteorologist Ginger Zee starts us off. GINGER ZEE, ABC NEWS METEOROLOGIST: Most of the nation is in a state of meteological exhaustion. The coldest winter in Minnesota in 33 years, the Great Lakes almost 90 percent frozen. Normally it would be just over 30. And New York City, buried. Now in their top 10 snowiest seasons. Snowfall totals from North Carolina up to Indianapolis between two and three times their normal. 75,000 flights canceled since December 1 -- that's an all-time record. And Pennsylvania, they've been in the heart of the misery, a giant pileup on Friday. ABC's Lindsey Janice (ph) was right there. (on camera): The sun was shining, the roads mostly clear, but there was one problem: temperatures plummeted overnight and turned this Pennsylvania Turnpike into a sheet of ice. (voice-over): Causing this five mile long chain reaction pileup, more than 100 cars, dozens injured. Almost all of this weather can be related to a single pattern locked in place. (on camera): All winter, the pattern has been stuck. Every time we go into the weather center here, we see the same thing, the jet stream cutting the nation in half. On the east, the coldest air in decades allowed to come as far south as the Deep South, the Gulf really. And then the jet stream just right in the right place that moisture rides along it, meaning snow storm after snow storm from the Great Lakes through the northeast. But that's also creating an extreme in the west, that big ridge over here gives record drought and heat. California last year, the driest year on record. (voice-over): President Obama traveled west Friday to see the drought up close. BARACK OBAMA, PRESIDENT OF THE UNITED STATES: What happens here matters to every working American. ZEE: Wayne Friedman from ABC 7 News in San Francisco visited a hay farm that's seen barely a sprout this year. WAYNE FRIEDMAN, ABC 7 NEWS SAN FRANCISCO: Ginger, what this drought is doing in California is unprecedented in five generations of living memory. ZEE: Friedman says the drought will affect everything from food prices to hydroelectric power. FRIEDMAN: We could see brownouts this summer from less water flowing through our rivers. For small agricultural towns, we're already seeing the effects, some of them have 50 percent unemployment. Bottom line, in California, a way of living could be ending. ZEE: But are the extremes of one year related to climate change? Stanford's Noah Diffenbaugh was been working through that very thorny link. He says man-made change does exacerbate the extreme weather events, meaning perhaps more intense storms, floods, tornadoes and droughts to come. Dr. Judith Curry of Georgia Tech says climate models aren't there yet, just not up to the task of distinguishing what has caused an individual extreme weather event. For This Week, Ginger Zee, ABC News, New York. STEPHANOPOULOS: Let's dig into this with North Carolina Governor Pat McCrory, Los Angeles Mayor Eric Garcetti, ABC's chief business and economics correspondent Rebecca Jarvis and Dr. Heidi Cullen, a research scientist who is the chief climatologist at Climate Central. Author of the "Weather of the Future." Welcome to you all. Rebecca, let me begin with you. Week after week after week of these storms. The economy definitely taking a hit. REBECCA JARVIS, ABC NEWS CORRESPONDENT: Absolutely, George. And we're seeing it on multiple levels. For individuals there's lost wages, there's the increasing costs of heating homes. Some estimates say as much as $4.5 billion in additional spending will go into heating bills this winter. Then you have businesses, the airlines, for example, have suffered massively under this 75,000 flight cancellations. United saying it's an $80 million cost to them. Cities are experiencing it. Of course, they're paying more to clear the snow. Chicago came out and said we expected to spend $20 million on snow removal this winter. Now it's $25 million and we're not even finished with the winter. A number of economists are looking at this as cutting into GDP growth. An average number of economists are seeing it as a .3 percent hit on GDP growth. And also there's just the lost spending that consumers aren't doing because they are staying inside. $15 billion in not going to restaurants, not going to the movies that's never going to come back. STEPHANOPOULOS: Those snow days add up. Governor McCrory, we're all seeing those pictures out of your state this week. It looks a little clearer this morning, but how much of this is going to set you back? GOV. PAT MCCRORY, (R) NORTH CAROLINA: It's having a big impact. The last two weeks has been extremely stunning and tough on the state. It's not as tough as the first episode of House of Cards, but it's been very tough on all of us. Our budget is already at its maximum regarding snow removal and that doesn't include our cities and small towns. We literally had six major metropolitan areas hit with a major snow storm twice now in two weeks. And it's a hit on our budget. And it's going to be a hit on the economy because people haven't been spending money for the last four or five days. STEPHANOPOULOS: I'm sure Kevin Spacey appreciated that shoutout. We'll talk to him about that in a little bit. Mayor Garcetti, let me take it to you, we just heard that correspondent in California saying this is affecting everything, this drought is affecting everything in the state of California, even changing a way of life. GARCETTI: Absolutely. This was the driest year on record. But, you know, it's coming at an immense cost, whether it's wildfires, whether it's changing how we get water. But governors and mayors, you know, we don't have the luxury of debating the issue. I think it's clear human beings have had an impact on creating the problem, but we have to solve it now. We're dealing with that in Los Angeles, because we've done some common sense things out here to conserve water, change out our landscaping, strengthen our building codes. But it's not a question anymore about this happening every so often, we're expecting this to be the new status quo. STEPHANOPOULOS: And you're getting to the question of why. Let me bring that to Heidi Cullen right here. And Heidi, first of all, one of the big points you make is that all extreme weather is connect -- the drought in the west connected to the blizzards in the east. HEIDI CULLEN, CLIMATOLOGIST: Yeah, well Ginger did a great job setting it up. The cold that we're seeing here is very much connected to this broader pattern. And really when you put it into context, climate change, burning fossil fuels means that we're going to see more of these very expensive extreme weather events, specifically the kinds of extremes we can expect -- more heat waves, droughts, floods. We're already seeing those. You know, this winter certainly doesn't disprove global warming. I think it's one of these things where every time we have a really cold winter we begin to ask ourselves all over again, so is global warming real or not. Cold winter doesn't mean global warming is gone. And really, when you look at the big picture, we've actually globally been incredibly warm. January is probably going to come in as one of the top three warmest Januaries on record. And, you know, the 10 warmest years have all happened since 1988. STEPHANOPOULOS: But your big point is that on these intense weather systems they're made more intense by climate change. CULLEN: That's right. I mean, basically when you warm up the planet, you've got more moisture in the atmosphere, which means that when it rains it rains heavier. And you can also evaporate more, so that means that the tendency for drought is going to get worse. So the kinds of droughts that we've been seeing in Texas, our in California right now, we know that climate change makes them worse. It's actually very similar to cigarette smoking and lung cancer, it increases the likelihood of that risk. We've already looked at the Texas drought in 2011. We know that climate change made that drought 20 times more likely. STEPHANOPOULOS: Governor McCrory, do you accept that argument? In the past you've said that you believe that this whole issue of climate change is in god's hands. MCCRORY: Well, I believe there is climate change. I'm not sure you can call it climate warming any more, especially here in the Carolinas. I think the big debate is how much of it is man-made and how much will just naturally happen, as the Earth evolves. And the question then is what do we do about it, and how much it will cost the consumer. I concentrate on cleaning the environment. I think that's where our argument should be, cleaning our air, cleaning our water and cleaning the ground. And we're at a brown fields area which we're in right now in Charlotte where we cleaned up the ground right here and cleaned up old brown fields and now we have great new development. But the whole issue of cleaning the environment I think is the issue we ought to talk about more than getting to a debate from the left and the right about climate change or global warming. It's all about cleaning our environment and have a good quality of life for not only now, but for future generations. STEPHANOPOULOS: What do you make of that argument Mayor Garcetti. GARCETTI: Well, I think I agree. I mean, I think personally the evidence is clear that we've had a role in it. I think people have recognized we've kind of lost the first few skirmishes with climate change. We're strengthening the defenses out here in Los Angeles, for instance, we consume the same amount of water as we did 30 years ago with a million more residents. So, we're Americans, we adapt, we innovate, we're good at doing those sorts of things. But, you know, whether it's Mayor Brainard in Carmel, Indiana changing out stop intersections and making them roundabouts to take global warming, CO2 emissions out of the air, or Mayor Becker in Salt Lake City making sure his buildings are built in a green way. Mayors, tribal leaders, governors are really taking action now because we can't afford to deal with the consequences. STEPHANOPOULOS: And Heidi Cullen, Mayor Garcetti made the -- made the point earlier, we have to get ahead of this because these patterns are not going to be reversed. CULLEN: We absolutely have to get ahead of it. And, really, you know, when it comes to dealing with our environment, I think one of the things that we're seeing is that burning fossil fuels has put additional heat-trapping greenhouse gases in the atmosphere. So cleaning up our atmosphere is -- is part of cleaning up our environment. It's all interconnected. STEPHANOPOULOS: And how about it, Rebecca? What are businesses doing to get ahead of this? JARVIS: It's innovate or die here, George. And a lot of businesses are, especially when you look at the food service businesses and the clothing businesses that rely so heavily on that supply, which is very much up in the air when you have these extreme weather patterns. Levi Strauss, for example, worked with farmers to come up with new, less water intensive ways to get that cotton that they use to make their denim. Caring, which is the luxury conglomerate that owns Bottega Veneta, Gucci, they're working on sustainable ways to bring their product to market. And they're working with their suppliers to get the actual underlying supplies that go into that clothing to make it more sustainable so that in any environment, whether the weather is going crazy or it's a normal weather pattern, they can deal with it and make their product and not be up in the air just because of the weather. And a lot of food companies are doing the same thing. STEPHANOPOULOS: And Heidi Cullen, what's the single most important thing business and government and all of us can do together? CULLEN: I think, first of all, it's talk about it. And then I think it's really look at all of the opportunities that are presented to us to use energy smarter, to grow our food smarter, to treat our water resources with great care and conserve. So I think across the board, we've got to come together, stop treating it as a partisan issue, because it really isn't, and just get started working on it. STEPHANOPOULOS: Let's hope we can do that. Up next, the roundtable takes on all the week's politics, from Ted Cruz's latest strike to those new Hillary papers and the collapse of the Syrian peace talks. And later, America's most evil politician, Kevin Spacey, from "House of Cards," is here live. STEPHANOPOULOS: T.J. Oshie dominates a thrilling shootout to give Team USA a win over Russia. More on that high point of the Winter Olympics coming up. But first, the big news out of Capitol this week. A big reversal by House Speaker John Boehner. Our roundtable weighs in on that and all the week's politics after a roundup from ABC's political director, Rick Klein. RICK KLEIN, ABC POLITICAL DIRECTOR (voice-over) (voice-over): It's yet another battle in the GOP's civil war. REP. JOHN BOEHNER (R-OH), SPEAKER OF THE HOUSE: I am disappointed, to say the least. KLEIN: Speaker John Boehner letting Democrats provide the vast majority of votes to raise the debt ceiling, with no strings attached. The same formula would have worked in the Senate, until Senator Ted Cruz spoke up. SEN. TED CRUZ (R), TEXAS: I intend to insist that it be a 60 vote threshold instead. I -- I think it's an irresponsible course of conduct to keep giving President Obama a blank check. KLEIN: That set up an extraordinary scene -- a roll call held open almost an hour, Cruz forcing his fellow Republicans to cast politically tough votes on the debt ceiling increase. The vote will resonate throughout 2014, starting with the Republican primaries, where Tea Party groups view it as surrender. And 2016 is top of mind, too. Chris Christie, once the Republican frontrunner, back on offense this week. GOV. CHRIS CHRISTIE (R), NEW JERSEY: Our party's priority should be on winning -- not winning the argument, winning the election. KLEIN: A taste of the old Christie. And for Hillary Clinton, a reminder from her past -- the diaries of an old friend, Diane Blair, revealing Hillary's unvarnished thoughts about her husband's affair with Monica Lewinsky. "It was a lapse," Blair writes. But she says, "to his credit, he tried to break it off, tried to pull away, tried to manage someone who was clearly a narcissistic looney-tune." Senator Rand Paul doing his best to keep those memories from fading. SEN. RAND PAUL (R), KENTUCKY: The Democrats can't say, oh, we're the great defenders of women's rights when the leading fundraiser in the country is Bill Clinton, who was a perpetrator of that kind of sexual harassment. KLEIN: For THIS WEEK, Rick Klein, ABC News, Washington. STEPHANOPOULOS: Thanks, Rick, for that. Let's get to the roundtable. Our chief White House correspondent, Jonathan Karl, joins us; along with Alicia Menendez, host of "A.M. TONIGHT," on our sister network, Fusion; "Wall Street Journal" columnist Peggy Noonan and Katrina Vanden Heuvel, editor and publisher of "The Nation." And, Katrina, let me begin with you on this, what happened in the House this week. John Boehner allowing a clean debt limit to go through, clearly exactly what the president wanted, but probably shrewd for Boehner, too. It clears the decks in a year where he thinks his party can pick up a lot of seats in November. KATRINA VANDEN HEUVEL, EDITOR, "THE NATION": Well, the failure of the shutdown, I think, concentrated the mind. And the hostage takers have left the scene briefly. I mean we have seen manufactured crises by a party which has eroded business confidence, hurt the economy, hurt families. And I think as 2014 approaches, the Republican Party decided they needed to pull up their bootstraps and get in place to pose any real challenge. With Ted Cruz, though, you have to -- you know, he is a anti-establishment figure. But let's remember, when we take anti-establishment, that Tea Party is a corporate-hugging, well-funded lobby. And you saw in Ted Cruz the possibility for our country moving forward is that the delusional is no longer marginal when you look at Cruz, but for the moment, he's been marginalized. So I think we need to refocus. The real conversation in this country should be creating jobs and investing in this country, not manufactured crises. PEGGY NOONAN, "THE WALL STREET JOURNAL": That's right. And the word (INAUDIBLE). NOONAN: Look, I think the Republicans' leadership on the Hill didn't take the bait and have a big fight and -- and cause a bit of a disturbance over the debt ceiling and the closing of government and all that stuff. I think it was wise. But I think, as usual, Mr. Cruz, the senator from Texas, decided he was going to go his own way and cause some trouble. JONATHAN KARL, ABC NEWS CORRESPONDENT: I mean this -- well, the White House might say the fever has broken. The use of the debt ceiling for hostage-taking, as the White House would put it, is over. You had the entire Republican leadership vote for this, both in the House, pretty much -- you know, Boehner, Cantor, McCarthy; in the Senate, McConnell, Cornyn, Thune. You had all the top leaders vote for it; and all the rank and file against it. So the question is, the fever has broken, will the patient survive? STEPHANOPOULOS: That's what I wanted to get to, and I'll bring this to Alicia. I thought "The New York Times" had an excellent analysis of this whole dynamic this week, when they talked about the "Vote No, Hope Yes Caucus." Jon Karl is right. The leadership voted for this. But only 28 Republicans voted for this, when the majority of the party knows this must pass and believe it should pass. And that is really sign of some kind of dysfunction. ALICIA MENENDEZ, HOST, "A.M. TONIGHT": Which makes it the fewest members of a majority to ever vote for a piece of legislation since 1991, when we had the first record filings. So this is huge. I think the question for Republicans becomes how, then, this plays out in the mid-term elections, right? Can Boehner prove that taking a moderate stance and showing some ability to get things done is actually what the party needs in order to secure the votes that they need to take back the Senate. KARL: And, you know, and Ted -- Ted Cruz does this thing. I mean, look, the Republicans in the Senate had this all set. This was going to be able to pass with only Democratic votes. He stands up, says I'm going to filibuster, suddenly they needed 60 votes. I'll tell you, Ted Cruz is so hated among his Republicans now, more so than ever during the shutdown, that the average -- that Tuesday lunch they have every Tuesday, he's going to need a food taster. KARL: I think that's right. VANDEN HEUVEL: -- to step back for a moment. These are games being played inside the Beltway. They're important, in many ways. But this is a manufactured crisis. I come back to it, you look at the top Republican leadership. They voted 19 times, collectively, to pass the debt limit when George W. was president. They even passed an increased pro forma the same year they gave the tax cuts, $350 billion, for the richest. So it's -- it's a game and it's a game that I think millions of Americans look at and wonder, what's going on inside a city which is supposed to represent what we care about? We need a different conversation. The debt ceiling has held up real conversations in this country about rebuilding a middle class, rebuilding an economy and a real recovery. STEPHANOPOULOS: And there has been a real conversation, as well, about health care, though. STEPHANOPOULOS: -- this week coming out. Number one, on Tuesday, we saw that the president putting off the health law mandate again on businesses between 50 and 100 workers. Yet, at the same time, later in the week, some news which showed that the enrollments in health care are picking up just a little bit. Over a million added to the rolls in the last month. Peggy Noonan, it sets up what this is going to mean coming in November, as well, it does seem that the enrollments are taking hold. We're not going to reach the goal of seven million by the deadly, but might get close, within a million. It's going to be very hard to take that away once people have it. NOONAN: Yes, I think there's so much doubt at this point and so much questioning about the HHS numbers, as put forward semi-regularly, that I'm not sure they're all that compelling. What I think is compelling is the amount of difficulty people are having with the ACA, trying to make it work in their lives. I think that's what 2014 is going to be about, ObamaCare. But I think 2016 is going to be about the split in the Republican Party and which way are they going to go as they choose their president. VANDEN HEUVEL: First of all, I think this has been a really important week or month for ObamaCare. Rough patches, yes, but it is broadly working -- 1.1 million have enrolled, a higher proportion of younger people, premiums are down, more are insured, insurance companies cannot deny preexisting coverage. What we're going to see in 2014 and what we're seeing now are Republicans lying, scaring people, actually keeping people from health care coverage. The governors -- Scott, Jindal, Perry, that's cruel. VANDEN HEUVEL: -- what's the Republican plan? Vote for me and I won't give you health care. VANDEN HEUVEL: Now, that's compelling. NOONAN: The Republican plan, just a few months ago, was, look, this isn't going to work, let's delay this part, let's delay this part, work with us, Mr. President. He said, we can't change this law, he'll veto any change that you put through. Now he, through executive fiat, is making the changes. He's not changing his own program because it's a great success. He is changing it because he knows it is surrounded by failure. VANDEN HEUVEL: He's working to fix it. STEPHANOPOULOS: There has been a slight uptick in the proportion of these millennials, young people who are really the key to this future. But still not at the levels it needs to be. MENENDEZ: Right. They needed it to be at about 35 percent. They have now amended those numbers to say if we hit 30 percent, then we will be happy. KARL: And they're still short of that. MENENDEZ: Right. And you -- but getting closer, and especially in this last month. You look at RomneyCare when it was first implemented in Massachusetts, young people tend to sign up as close to the deadline as possible. So I think you're going to continue to see these numbers push up. The idea with the young invincibles is that this entire plan only works if we sign up because we are young, because we are healthy, because we make the marketplace work. You saw yesterday a national youth enrollment day. MENENDEZ: -- to get these young people on the rolls. KARL: Here's why it matters, George, because October 1st, that's when we find out what the premiums are for next year. And if you don't have a high enough proportion of young people, premiums for next year are going to be going up right as we're going into the -- the month before the election. VANDEN HEUVEL: But, you know, there is a conventional wisdom about 2014 that ObamaCare is going to hurt the president. I take issue with the conventional wisdom. I think the numbers -- a day in politics is a lifetime. But I think the numbers are going to get better. I think the minimum wage initiatives around the country are going to move a lot of people to come out in a mid-term. And I think the GOP implosion over immigration is going to seal their fate with Latinos heading into 2016, as well. STEPHANOPOULOS: That may be 2016, but it could help them in 2014, not having that come up in this election. I want to move on now to Syria, because it really was a horrific week in Syria. STEPHANOPOULOS: We see some of the images from the region right now. U.N. Ambassador Samantha Power called it the worst humanitarian crisis in a generation. The director of our own National Intelligence, James Clapper, calls it an apocalyptic disaster. And John McCain, seeing images like this, Tweeted, "These images haunt me. What haunts me more is that we'll continue to do nothing." And Jon Karl, on the heels of this, we saw the peace talks in Geneva collapse yesterday. In fact, the U.N. representative heading them had to apologize to the people of Syria for the collapse, putting much more pressure on President Obama to come up with a change in approach. KARL: Yes, there's no question. And the White House has made it clear the president's not initiating a new review now, if there were to be a new review. The options are incredibly limited, George. I mean one is, you could have air strikes to hit the -- kind of the assets that are doing all the killing for Assad right now. For instance, these barrel bombs is what we're seeing now. They're dropped out of helicopters. So some are asking, well, why don't we go in air strikes, take out Assad's helicopters, take out his air force? STEPHANOPOULOS: The military has been very much (INAUDIBLE). KARL: The military says well, then what? The military has been against it. And arming the opposition is almost an idea who's time has gone. I mean we suspended aid to the rebels two months ago because some of that aid was getting in the hands of al Qaeda, the opposition is such a mess. so the options are incredibly limited. But I think one person that is haunted here is Samantha Power, our ambassador to the U.N., whose whole career was built on making an argument about the responsibility to protect when you have a crisis like this. And now she's saying, the biggest crisis in a generation and the United States is effectively doing nothing. VANDEN HEUVEL: The humanitarian crisis is horrific. But let's not forget the diplomatic success in forcing Syria to dismantle its chemical weapons. VANDEN HEUVEL: -- we have to push for humanitarian routes to be opened. I am sure there are back channel discussions with Russia, tougher ones than we're seeing in the U.N. Security Council. But there needs to be tough diplomacy, a negotiated settlement, a political solution is -- is going to be key to a true humanitarian resolution of it. Militarization of this is a disaster. And let's not forget something which is controversial, but true. Many of these killings of civilians are also being done by these militant insurgents, some of them with links to al Qaeda. Negotiated settlement, let's bring as much humanitarian aid but let's not forget diplomacy. STEPHANOPOULOS: And, Peggy, she brings up one of the most -- the scariest parts of all this, because Syria, right now, has become a breeding ground for a whole new generation of al Qaeda terrorists. NOONAN: It has. Look, Assad is not going to be negotiated out. Assad feels he is fighting for his life. I think the biggest thing America could do is help with the refugee situation. That will take financial aid. That will take people, too. But sometimes that's what you can do. NOONAN: And I think it is the refugee thing that is something that at least quickly, we could be helpful on. And that is also strategically a wise move. MENENDEZ: But you -- you can't -- they can't have these political negotiations until they change the game on the ground. So even if we all believe in diplomacy, even if we all believe in humanitarian aid, there is simply the reality that Assad has no reason to leave right now. STEPHANOPOULOS: He's got a big backer in Russia. VANDEN HEUVEL: Peggy is right, what you want to change on the ground is double down on the assistance to refugees, to humanitarian assistance. KARL: -- of the entire conflict. The last three weeks have been about as bad as it's been. KARL: While they've been at the negotiating table. VANDEN HEUVEL: -- the options, as you said, are so limited. But people like John McCain are just shockingly delusional if you -- they think that you're going to pump more weapons in there and not hurt more civilians. VANDEN HEUVEL: That is not a reasonable outcome. STEPHANOPOULOS: I want to get to one more thing before we go. And Peggy, you had a column this week about those papers we saw from Hillary Clinton, from her old friend, Diane Blair, who died in 2000. STEPHANOPOULOS: A University of Arkansas professor. And what these are are notes and dairies of her conversations with Hillary pretty much through -- NOONAN: Yes. STEPHANOPOULOS: It wasn't a lot of new news to close watchers of Hillary Clinton, but still quite revealing. NOONAN: I think so. You know, I -- it reminded me of the intensity of the personal drama going on in the White House. Some White Houses are relatively free of profound personal drama. That one was not. STEPHANOPOULOS: (INAUDIBLE) a little PTSD there. NOONAN: So -- so that was all pretty interesting. NOONAN: -- but this is the way it is. STEPHANOPOULOS: -- I'm pretty sure, by a long shot. This is all pretty much ancient history to you and a whole generation of voters. Do you think they're going to care about it if she runs next time? MENENDEZ: No, especially because this has all been litigated, right? There's nothing new that's coming out in these papers. I think there's a real debate to have over whether or not Hillary Clinton should be the Democratic nominee. I think there's a real debate to be had on whether or not she should be president of the United States. I don't think that debate is in relitigating the past. NOONAN: Amen, I agree with Alicia, because I do think this -- listen, news that Hillary Clinton is tough, disciplined and smart? No. What this country deserves is to learn more from Hillary Clinton about what she stands for. I mean, does she stand for Elizabeth Warren's idea of extending Social Security, or where does she stand on surveillance or trade. This is what, you know -- and I think that's what people want to know. STEPHANOPOULOS: That's what we're going to be looking for. Thank you. I'm sorry, Frank, we're out of time on this one right now. Up next, Michael Sam comes out. Is the NFL ready for him? Is he ready for the NFL. And before we go to break, let's test the roundtable with our powerhouse puzzler from Alex Jalloway (ph). OK, guys, you're ready? "Which president's inauguration had to be held inside in the Senate chambers thanks to a blizzard?" Quite timely there. We're back with everyone's answers in less than two minutes. STEPHANOPOULOS: OK. So how did you do with our puzzler? How did everyone here do the question? Which president's inauguration was held in the Senate chambers because of a blizzard? NOONAN: Calling my father to get answer. STEPHANOPOULOS: That's the smart thing to do. MENENDEZ: I'm so debilitated with the Google. STEPHANOPOULOS: And yet he died several days later -- no, Reagan was very cold, but that wasn't the one. William Howard Taft. ALICIA: That was going to be my guess. NOONAN: Reagan's second inaugural was moved inside the Capitol. It was, because of a terrible snow storm. STEPHANOPOULOS: Well, we're going to have to do a little more work on that. Kevin Spacey coming up. We'll be right back with our expert panel and whether the NFL was ready for its first openly gay player. STEPHANOPOULOS: There is Michael Sam getting a standing ovation at a Mizzou basketball game last night. The All American from Missouri looking to become the NFL's first openly gay player. Sam's very breaking announcement on ESPN's Outside the Lines made headlines month before we even know if he's going to be drafted. We have a panel of experts here to discuss what it means for the league and Sam's career. First, the back story from ABC's David Wright. MICHAEL SAM, UNIVERSITY OF MISSOURI DEFENSIVE END: I came to tell the world that I'm an openly proud gay man. DAVID WRIGHT, ABC NEWS CORRESPONDENT: With that announcement on ESPN, Michael Sam made history. SAM: I understand how big this is, because this is a big deal. But I know what I want to be and I want to be a player in the NFL. WRIGHT: Sam's decision to put his sexuality front and center now faces a serious test: the NFL draft. The University of Missouri defensive end is considered a top contender. UNIDENTIFIED MALE: Michael Sam is doing the right thing. And I hope the National Football League does the right thing and let this kid get a chance to play. WRIGHT: David Kopay has some idea what Sam is going through. He played for the 49ers and the Packers in the 60s and 70s. Then, right after he retired, made an announcement of his own. DAVID KOPAY, FRM. NFL PLAYER: December 9, 1975. WRIGHT: And you remember the exact date. WRIGHT: Kopay was the first retired NFL player to come out as gay 40 years ago. A lot has changed. And plenty of other professional athletes have followed suit. Last year, basketball's Jason Collins and soccer's Robbie Rogers came out and declared they're gay. But football? Football is another order of magnitude altogether. JON STEWART, DAILY SHOW HOST: Who is this gay football player? Oh, probably a kicker, huh? Am I right, a kicker, you know, he's gay, kicker. UNIDENTIFIED MALE: At 6'2, 260 pounds, University of Missouri defensive lineman Michael Sam used skill and strength to lead the SEC in sacks last year. UNIDENTIFIED MALE: He's a hell of a football player. And that's what I'm trying to get people to focus on. WRIGHT: PR guru Howard Bragman, an ABC News consultant, worked with Michael Sam ahead of his announcement. The reaction, including the clover of Sports Illustrated, overwhelmingly positive. One Dallas sports anchor's commentary went viral. UNIDENTIFIED MALE: You beat a woman and drag her down a flight of stairs, pulling her hair out by the roots, you're the fourth gay taken in the NFL draft. You lie to police trying to cover up a murder, we're comfortable with that. You love another man, well now you've gone too far. WRIGHT: Rick Welch, president of the Golden State Warriors is the highest ranking executive in pro-sports who is openly gay. RICHARD WELCH, PRESIDENT, GOLDEN STATE WARRIORS: He squarely put it back to the teams of the NFL to make a decision and make a decision becomes a very public one. WRIGHT: The NFL is already grappling with what can be an abusive lockerroom culture. Players bullying one another. Just this week, the NFL released a scathing report confirming a pattern of abuse and homophobia within the Miami Dolphins organization. This week on Twitter, some of Michael Sam's potential teammates did not exactly welcome the idea of an openly gay player sharing the locker room, some of them calling the whole thing a distraction. But Robbie Rogers says for him it's been no big deal. ROBBIE ROGERS, L.A. GALAXY MIDFIELDER: In our locker room, the guys are very respectful and, you know, we make jokes. WRIGHT: What kind of jokes? ROGERS: Well, like, guys will be like I'm the first person they come to for like fashion advice. And it's like, come on, like, are you serious? And at some point in time that won't be a big deal. Today, it's a very big deal. What advice would you have for Michael Sam? WRIGHT: Just play football, you're saying. UNIDENTIFIED MALE: Yeah, play football. Be yourself. WRIGHT: A lot of people will be rooting for him. For this week, David Wright, ABC News, Los Angeles. STEPHANOPOULOS: Thanks to David for that. Let's talk about this now with Pete Thamel from Sports Illustrated; Cyd Zeigler, co-founder of Outsports.com; and NFL punter Chris Kluwe. Welcome to you all. Pete, let me begin with you. Right after this announcement was made, you wrote a big story in Sports Illustrated that did stir up some controversy, even though NFL officials like the commissioner, Roger Goodell, have been very supportive of this publicly, you quoted several off the record suggesting that Sam has a daunting path ahead, the NFL is not ready for him. One said it's still a "man's-man's game." Do you stand by that reporting? Do you think these private comments are more reflective of the public support we've seen for this? PETE THAMEL, SPORTS ILLUSTRATED: Well, certainly this is obviously a seminal moment in sport and in culture right now. But I still think Michael Sam has a barrier to break. And I think the NFL as a player looks at him skeptically. And I do there's the dreaded word "distraction," George, that keeps coming up. STEPHANOPOULOS: We keep seeing it, yes. THAMEL: Yes. And I really think that that's the next step. It's going to take a strong owner, a strong general manager, a strong coach in order to draft Michael Sam, because he's not a slam dunk prospect. STEPHANOPOULOS: That's his prospects to get in to the league. But, Cyd, on this other question of, you know, how welcoming the league is going to be, if he gets in, you know, this Richie Incognito report out of Miami does, you know, reinforce the views of those who say this is going to be a hard fight. CYD ZEIGLER: You know, Jim Buzinski and I, on Outsports, we have written about over 200 athletes who have come out on their teams and publicly in every sport, including football, at every level in every state of the country. And every single one of them says the same thing, before they came out, they heard a lot of homophobia on the team, when they came out, they were completely embraced by their team. And this includes a football player at Middle Tennessee State, Alan Gendreau, who was out the entire four years he played at Middle Tennessee State. After they came out, they are embraced by their teammates. And the people who are the most homophobic in the locker room before they came out, are the first guys to come up that come up to them, shake their hand, and apologize for what they've said. People get it. And all the stuff about the horrors of the NFL locker room is completely overblown. STEPHANOPOULOS: You spent eight years in NFL locker rooms. CHRIS KLUWE, NFL PUNTER: I agree with Cyd. It's very much if you haven't been inside an NFL locker room, you don't understand the camaraderie, the teamwork that goes on in there, because when you're in the locker room during the season, you spend more time with your teammates than you spend with your family, like, you're there for 10, 11, 12 hours a day, and so you get to know guys really well. And I've always said that I think the main problems are going to come from executives and front office, because they are stuck in the older mindset, this older mentality. And they need to figure out, do they want to be Branch Rickey or do they want to be Ben Chapman? STEPHANOPOULOS: You believe you were cut in part because of your -- you were outspoken on the issue of gay rights. You spent some time with Michael Sam last Saturday before the announcement. Is he ready for all of this? KLUWE: I think he is as much as he can be. I don't know that anyone is ever really ready for a moment like that. But I think he's well-prepared. I think he is an intelligent, articulate young man. And I think he has the tools that it takes to deal with those isolated incidents where people are going to have issues with him because of his sexuality. I think he'll be OK.
STEPHANOPOULOS: Pete Thamel, those are the psychological issues. You were pointing at the, you know, physical barriers ahead facing Michael Sam. Some people say he's not fast enough, some people say he's not big enough. Do you think, bottom line, that the act of coming out increases or decreases his chances? THAMEL: I think, George, on the bottom line, it would decrease it, because I had one former general manager tell me, in an NFL draft room, when you are sitting there, OK, we pick in five spots, these -- we're going to pick between these three players, the general manager told me, well, that could break a tie. Well, you know, if we're in the sixth round, do we want to bring in again that the dreaded D-word, the "distraction"? And, you know, the general manager told me, probably wouldn't be a good situation for a first-year head coach. And there are a lot of sort of built-in excuses. NFL people are risk-averse at the end of the day. And so I'm optimistic for Michael Sam. It's a wonderful story. I hope he really gets a true chance to get drafted and show what he can do on the field. STEPHANOPOULOS: Could be a very different situation from Jason Collins, who was at the end of his career in the NBA. But this could be a struggle. STEPHANOPOULOS: Getting into the league? ZEIGLER: Yes. Why is it going to be a struggle? Why would it be any more so than for anybody else? The NFL teams, their whole goal is to get to the biggest media circus and the most distracting game of the entire season, the Super Bowl. And we are putting out there that some general manager is going worry about a couple of cameras showing up at practice and asking a few questions? If a general manager and a coach cannot handle a gay player in the locker room, they should resign, not because of social justice issues, but if that can torpedo your season, you're not doing your job. 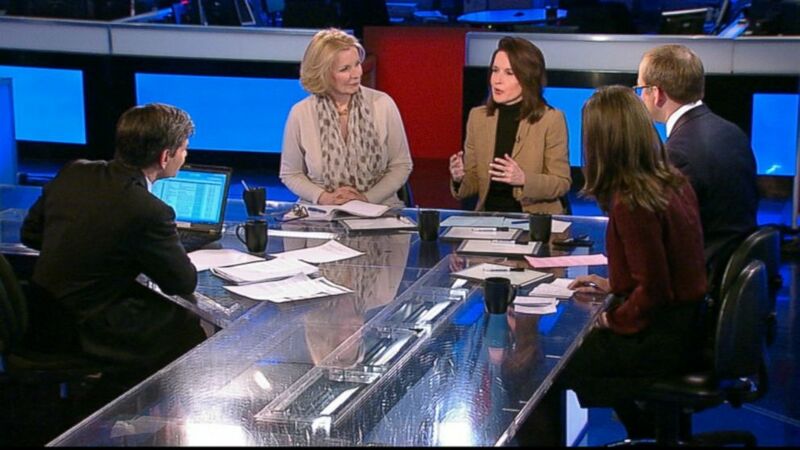 STEPHANOPOULOS: On the margins, do you think it will make a difference? KLUWE: I think it will. And I think it's unfortunate, because there are general managers and executives that simply believe this way. And they're not going to change their mind. And I think it's our job as a society to hold them accountable, to not let them get away with plausible excuses of, oh, well, he's not just the right fit or, you know, maybe he doesn't quite, you know, work well with the locker room chemistry. It's our job as citizens to say that Michael Sam deserves a fair chance, not because he's a gay football player, but because he's a football player and he wants to go out and play football. STEPHANOPOULOS: I think we can all agree on that. We all hope he gets a fair chance. Thank you all very much. And when we come back, Kevin Spacey from "House of Cards" is here live. There he is. BARACK OBAMA, PRESIDENT OF THE UNITED STATES: I'm just wondering if Reed brought advance copies of "House of Cards." I wish things were that ruthlessly efficient. OBAMA: It's true. I was looking at Kevin Spacey, I was thinking, man, this guy is getting a lot of stuff done. STEPHANOPOULOS: President Obama likely to catch a few "House of Cards" episodes on his weekend off in California. All of you who have already binged through the whole season, don't spoil it for the rest of us. Kevin Spacey is here live to talk about it after ABC's John Donovan looks at why so many Americans are entertained by a city they appear to hate. JOHN DONOVAN, ABC CORRESPONDENT (voice-over): The old joke that Washington is Hollywood for ugly people seems to be over now that TV has discovered Washington as never before with the breakthrough kind of streaming drama of Netflix's "House of Cards"; the Emmy-winning parody of missed opportunity known as "Veep"; "Scandal," a show about Washington politics and scandal; "Homeland," with a possible double agent on the loose in Washington. CLAIRE DANES, "CARRIE MATHESON," "HOMELAND": We have to go in. He's on to me. RUPERT FRIEND, "PETER QUINN, "HOMELAND": Come back, Carrie. DONOVAN (on camera): If somebody landed from Mars now in Washington, D.C., and turned on the television, what's the Washington they would see? CHRIS ORR, FILM CRITIC, THE ATLANTIC: Oh, it's a friendly place full of people doing their best -- no, it's a den of inequity and corruption. What's striking about these shows is even the heroes are not particularly heroic. JAMES STEWART, " JEFFERSON SMITH," "MR. SMITH GOES TO WASHINGTON": Well, I'd like to get them said this time, sir. And as a matter of fact, I'm not going to leave this body until I do get them set. DONVAN: And it's not the West Wing where there's a whole team of good people fighting the forces of dark and evil. UNIDENTIFIED MALE: Which is that never doubt that a small group of thoughtful and committed citizens can change the world. UNIDENTIFIED MALE: So you lied to his face? KEVIN SPACEY, ACTOR: No. I revised the parameters of my promise. UNIDENTIFIED MALE: Which is lying. DONVAN: He's a puppet master politician, pulling all the strings, even killing to get what he wants. UNIDENTIFIED MALE: There is but one rule, hunt or be hunted. DONVAN: Capturing perhaps a certain mood on the loose in the culture at large? UNIDENTIFIED MALE: We have an entire political movement essentially based on suspicion of government, the Tea Party, congress is constantly setting new records for unpopularity. So it's definitely a moment when people are thinking about Washington and they're thinking about Washington in really negative terms. DONVAN: And so Vice President Selina Meyer, Julia-Louis Dreyfus on Veep, she is a walking character flaw of constant and constantly frustrated ambition. JULIA-LOUIS DREYFUS, ACTRESS: Why didn't I know about this? I'm going, you can't keep me out of this. DONVAN: So where did all the real heroes go? Film director Pierre Bagely who just took over the Washington, D.C. office of Motion Picture and Television Development, thinks they're still out there, waiting to be found by the scriptwriters. PIERRE BAGLEY, OFFICE OF MOTION PICTURE AND TELEVISION DEVELOPMENT: All of the intrigue that goes on on Capitol Hill, the White House, I think it's fodder for great drama. And I think they're catching up to it. DONVAN: The other thing Bagley says about Washington has storyline. BAGLEY: This is the most exciting city I think in the world. There's no other city like Washington, D.C.
DONVAN: You think Washington is more exciting than Hollywood? DONVAN: You think Washington is real? BAGLEY: Oh, it's real. Well, let me say this, it's as real as it gets. DONVAN: And as if on cue, we are interrupted by one of the presidential helicopters breaking in on the conversation. If this were a TV show, it would have ruined the shot, but not in Frank Underwood's world where nothing happens unless the puppet master politician wants it to. For This Week, John Donvan, ABC News, Washington. STEPHANOPOULOS: And, here he is live. Kevin Spacey playing Frank Underwood, thanks for coming in this morning. SPACEY: Thank you for having me. STEPHANOPOULOS: So is he right there, is Washington more exciting than Hollywood? SPACEY: Look, for me it's like performance art, you know, I sometimes watch it actually we can get done shooting on a day and I'll come home and turn on the news and I'll think, you know, our storylines are not that crazy. They're really not. STEPHANOPOULOS: With some exceptions. Again, I'm not going to give too much away from the second season. But it does seem like even President Obama has a little bit of Frank Underwood -- envy, the ruthlessly efficient Frank Underwood. SPACEY: I can imagine why he would. I've thought actually over the last year it must be really interesting for not just an American public, but people around the world to view a very effective congress that gets things done. And so I can imagine he must feel, gosh, I wish we could move that quickly. STEPHANOPOULOS: How do you put the two together? I mean, clearly this show is striking a cord out there in the country at a time when the country hates Washington more than ever? SPACEY: Well, I've heard from lots of people, you know, that some people feel that 99 percent of the show is accurate and that the 1 percent that isn't is that you could never get an education bill passed that fast. STEPHANOPOULOS: Forget about every other crime you see over the course of the show. And you know you've got all these members of congress. I want to show a group of them. From now this News.com who seem to have a little Frank Underwood envy too. UNIDENTIFIED MALE: I hope the bill is going to come up this Wednesday. UNIDENTIFIED MALE: I'd never make such a big decisions so long after sunset and so far from dawn. UNIDENTIFIED MALE: It's still going to come up. SPACEY: He was the House Republican whip who was really a very generous to me. I spent -- I sort of shadowed him in the Capitol a little bit to understand and learn what it's actually like to be the majority whip. But actually said recently that, you know, if I could kill just one member of congress, I would never have to worry about another vote. STEPHANOPOULOS: I think that's pretty true. The example that would set. So what did you pick up from following him around? SPACEY: Look, it's particularly interesting for him, because there are so many new members of congress who were sort of brought in, in the Tea Party and we're going to fight against Washington and we're not going to do it the usual way, that it's very difficult to harangue 218 congressman to vote a particular way you want them to vote. So I don't envy him the position. It's not easy. But it was very for me fascinating to go to a couple of whip meetings and actually see what the agenda is, what they're going to put out there, how they do it. And so for me it was very helpful to understand what it's actually like to try to whip. STEPHANOPOULOS: And the show does get all those little details of the setting, and a lot of the conversation exactly right. But I wonder what you make of -- you know, some people, some critics of the show look at it and say, as you point out a lot of people think this is the way it must be. But one Marcia Angell, a doctor, says, "blanket cynicism," talking about the show, "gives the illusion of understanding, not really understanding what's going on." STEPHANOPOULOS: A different kind of fantasy. SPACEY: ...people who are willing to do whatever they have to do. STEPHANOPOULOS: And if he had the kind of coverage doing those -- going through those ruthless tactics that he would get today going through them, he might not be able to get what he got done. SPACEY: Or even Abraham Lincoln. You know, you look at the film Lincoln, which showed him as a very effective politician willing to give positions to various people in order to get votes for something he thought was more important. And today that would probably be a scandal. STEPHANOPOULOS: Kevin Spacey, thank you very much. House of Cards is terrific. You can see every episode on Netflix right now. And we'll be right back. STEPHANOPOULOS: And now we honor our fellow Americans who serve and sacrifice. This week, the Pentagon released the names of four soldiers killed in Afghanistan. And that is all for us today. Thanks for sharing part of your Sunday with us. Check out World News with David Muir tonight and see you tomorrow on GMA.